In Centrum Użyteczności Publicznej CUP (‘Centre for Public Utilities’) at Jana III Sobieskiego 9 ST there are located non-governmental organizations actively operating in our county. The main idea for building the CUP was to support non-governmental organizations and locating them in one place. - air-conditioned conference room for 80 people. The main aim of the CUP is to grant premises to non-governmental organizations so that they are able to perform their tasks within the scope of their statutory activities. The building is fitted to the needs of persons with reduced physical capacity. 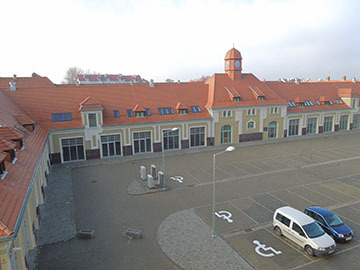 The Project „REWITALIZACJA ZABYTKOWEGO BUDYNKU POWOJSKOWEGO NA NOWOCZESNE CENTRUM UŻYTECZNOŚCI PUBLICZNEJ W OSTRÓDZIE PRZY ULICY JANA III SOBIESKIEGO” (‘Revitalization of the historic post-military building and its conversion into a modern Centre for Public Utilities in Ostróda at Jana III Sobieskiego ST’) of the Ostróda County was co-financed by the European Union from the European Regional Development Fund under the Regional Operational Programme Warmia and Masuria for the years 2007-2013. Project value: 6 547 432,40 PLN. Susidised amount: 4 518 832,21 PLN. The whole investment shows the significance of non-governmental organizations as partners for the self-government. Dynamic activities foster the development of the county and allow for successful activities for the sake of the residents.